Stellar Master Elite are a band from Germany that has been featured before in this zine and plays a mixture of black and doom metal with elements of ambient and this is a review of their 2015 album "III: Eternalism - The Psycholospherical Chapter" which will be released in October by Essential Purification Records. A very powerful bass guitar and ambient sounds start off the album and a few seconds later melodies and military style drum beats are added into the music which leads up to more of a black metal style along with some deep and grim screams that also use growls at times and a great portion of the tracks are very long and epic in length. Most of the music sticks to either a slow or mid paced musical direction while there are also some fast parts and blast beats and also gets atmospheric at times and after awhile the vocals get more high pitched and you can also hear elements of industrial at times and some tracks also bring in a small amount of spoken word samples. The songs at times also bring in elements of death metal while a later track also brings in a small amount of clean singing and tribal parts giving the song more of a goth feeling and as the album progresses the music gets more experimental and the synths also makes the music sound a lot more powerful while a later track brings in elements of black'n'roll. Stellar Master Elite continue their ambient and atmospheric approach to black and doom metal from the previous recording while the blackened parts dominate most of the heavier sections and they also get more experimental with the songs and display a great amount of progress as musicians, the production sounds very professional while the lyrics cover a harsh reflection of man's own relationship with the sky above and the passage of ages. 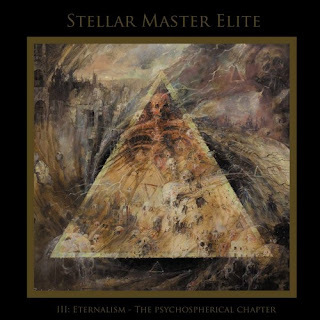 In my opinion this is another great sounding recording from Stellar Master Elite and if you are a fan of this band, you should check out this album. RECOMMENDED TRACKS INCLUDE "Desperate Grandeur" "Hologram Temple" and "Mark Of The Beast". 8 out of 10.